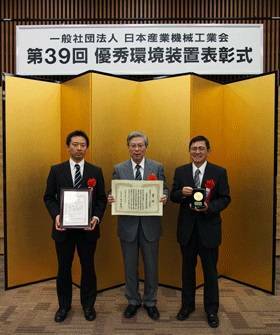 A plant system that captures carbon dioxide (CO2) from flue gas emissions developed by Mitsubishi Heavy Industries, Ltd. (MHI) has received the Minister of Economy, Trade and Industry Award at the 39th Outstanding Environmental Systems Awards hosted by the Japan Society of Industrial Machinery Manufacturers (JSIM). The system was highly evaluated for its superlative reliability and economy achieved through ongoing technology improvements carried out over many years, for its abundant delivery track record in commercial applications, and for the effectiveness of its carbon capture and storage (CCS) technology in helping to prevent global warming. MHI's CO2 capture technology employs a high-performance chemical absorption method utilizing the absorption solvent "KS-1," which was jointly developed by MHI and Kansai Electric Power Co., Inc. The technology results in significantly less energy consumption than other recovery methods. For more than two decades, MHI has undertaken an ongoing quest to achieve enhanced energy savings and reductions in solvent consumption and plant size. Since 1999 the company has delivered 10 CO2 recovery plants for chemical plant applications worldwide to capture CO2 from the flue gas of boilers fired by natural gas or fuel oil, and one other plant is currently under construction. This track record places MHI as the leader in commercial applications of CO2 recovery plants. In CCS applications, MHI has built a CO2 capture plant on a scale of 500 metric tons per day (mtpd) jointly with Southern Company, a major U.S. electric utility, at the Plant Barry coal-fired power generation plant in the U.S. state of Alabama. CCS demonstration testing for coal-fired flue gas has been under way at the plant since June 2011. MHI has also been participating in various CCS projects around the world, including the technology qualification program of a 3,400 t/d CO2 capture plant for a gas-fired combined heat and power (CHP) plant in Norway. Collectively these endeavors place the company in a solid position to accommodate construction of commercial-scale plants to capture CO2 from the flue gas of thermal power plants. Another important application possible is enhanced oil recovery (EOR), which is employed to boost crude oil production. In EOR, CO2 is injected into an oil reservoir suffering from low productivity. JSIM's Outstanding Environmental Systems Awards program was launched in 1974 to promote research and development of environmental protection technologies and the adoption of outstanding environmental systems. The program is supported by the Ministry of Economy, Trade and Industry (METI). Candidates for the awards are solicited from manufacturers of environmental systems and environmental systems engineering firms nationwide, and the awards are decided by a committee of specialists from diverse perspectives including originality, economy and future potential. 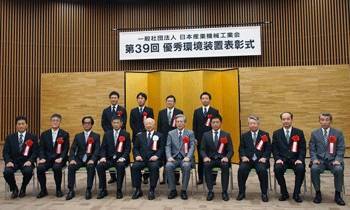 Besides the METI Minister's Award, three other awards are given each year: the Industrial Science and Technology Policy and Environment Bureau Director-General's Award, the Small and Medium Enterprise Agency Director-General's Award, and the JSIM Chairman's Award. 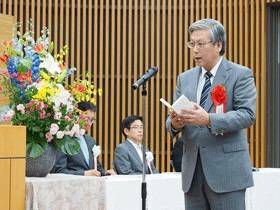 Encouraged by its receipt of the METI Minister's Award, MHI now aims to pursue further advances in CO2 capture technology in order to make increasingly significant contributions to worldwide efforts to prevent global warming.